Born way out West, where faces are long, cracks are steep and where modern cragsters have learned to be well organized and fast on the draw. Store/carry all the stuff needed for craggin� (shoes & draws as well as trad hardware) in the �ROLL, then when you get called out for the next lead, unfold the tarp and transfer gear to your harness or SPEED SLING in the specific order dictated by the route. Tarp keeps gear out of the dirt, has plenty of gear loops plus 4 see thru pockets that keep track of small stuff: tape, nail clippers, vitamin I, keys, energy bars, etc. Stash in pack or carry car-to-crag or off to the gym via web handles. Hang tabs included for gutter rail gear sorts or wall mounting back at the ranch. Go anywhere, Climb Anything! 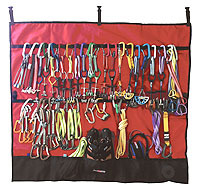 This popular assortment of gear will give you the confidence and means to adequately protect many trad pitches and every conceivable top rope set up. The DREAM RACK is a smart collection of varied pro chosen to compliment one another in size, function and weight. It will also expand your familiarity and experience with placing different types of pro - optimized into one cohesive kit - ready to hit the road! Substitutions may be made due to stock availability... Let us help you put together your CUSTOM DREAM RACK.